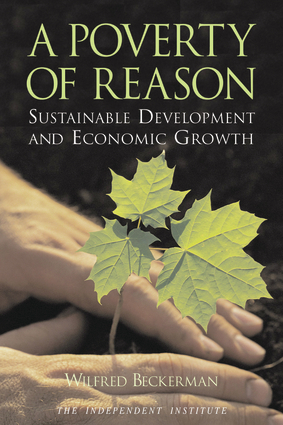 In this detailed economic investigation of sustainable development, a noted professor of economics argues that many of the alarms commonly sounded by environmentalists are, in fact, unfounded, and that current sustainable development policies should be reconsidered in light of their effects on the earth's human population, such as increased poverty and environmental degradation in developing countries. In a rare balanced counterpoint to popular sustainable development rhetoric, Professor Beckerman forces policy makers to consider whether future generations have rights that morally constrain and trump the claims of those alive today, particularly the masses of people living in dire poverty, arguing that the current sustainable development program is a menace to the prosperity and freedom of both current and future generations. Wilfred Beckerman is an emeritus fellow of Balliol College at Oxford University. Dr. Beckerman is an economist and the author of many academic articles and several books including In Defence of Economic Growth, Small is Stupid and most recently Justice, Posterity and the Environment (with J. Pasek). Dr. Beckerman has served on Britain’s Royal Commission on Environmental Pollution, and chaired the Academic Panel of Economists for the UK Department of the Environment from 1991 to 1996.